Fernandes Line Construction does all types of construction dealing with poles and wires. We install parking lot lights and light trimming, as well as maintain private electrical lines for businesses and homeowners. 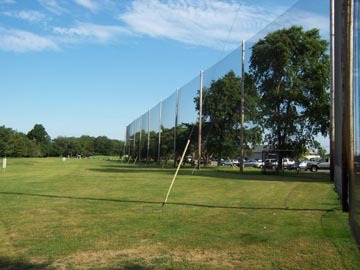 We also install sport netting for golf courses, driving ranges and baseball fields. In addition, we also install residential batting and golf cages. Please check out our references. Our list includes businesses and homeowners we have completed projects for including installation of fiberglass and wood utility poles (some up to 100'). Other projects include Landfill/Transfer station paper containment and bird control/prevention; electrical line construction and pole setting. celebrating 19 years in business.